Alas, I found it pretty entertaining, and very astute how the Corvette museum in Bowling Green, Kentucky is embracing their Sink Hole Disaster, for which not surprisingly, attendance swelled at the museum last year! Now, like A-L-L businesses, i.e. ; Museums, etc, how do they keep the enthusiasm, and more importantly attendance, nee entrance fees (income revenues) up? Meanwhile, naturally Car Enthusiasts the World Over rejoiced 'bout "Muscle Cars" being the last segment to go "Reorge Rettson" full-tilt AAstro Autonomous on us! As I've previously mused 'bout how Autonomous Cars will surely be thy Death Noll for Auto racing in the future, right? Meanwhile, thanks largely to a "Foreigner;" Hey! Yuhs didn't think I was gonna leave Corvette's Blue Oval nemesis outta this story, did Yuhs? While due to another "Foreigner" simply known as Zora, albeit probably Mr. Zora Arkus-Duntov to us, one of America's most revered true two-seat Sports Cars truly blossomed! Yet I tend to forget that thee original "Doctor Z" (Zora Arkus-Duntov) also worked his magic upon despised arch rival "FoMoCo's" (Ford Motor Company) fabled Flathead V-8 with his Arden high Performance aluminum Heads. Not to mention that his ultimately banned Corvette Grand Sport's - presumably a continuation of the fabled Corvette SS racers, for which I've seen one on display at the IMS Hall of Fame museum previously - also came courtesy 'O Zora's leadership. Although Zora intended to build 125 examples of this lightweight 'Vette, only five were built and raced briefly before General Motors put the Kybosh upon them, since Duntov had built them in secret without corporate blessing! Although a later Blue Oval driver with the moniker of "SuperTex," nee A.J. Foyt drove one! Foyt simply drove anything he could get his mitts upon. 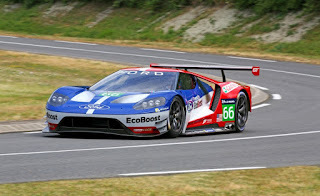 Whilst other Bowtie luminaries such as 'El Capitano, aka Roger Penske and Jim Hall drove them, along with 'BONDO, (Bob Bondurant) whose played both sides of the fence - while I've seen Tom Armstrong's beautiful example many times in anger at local Vintage Car races. As this ultimate 'Vette Was built to defeat charmed Snake Oil magnet 'Ol 'Shel's all conquering Cobra's. And another revered vehicle from those Halcyon '60's is making its return to le Circuit de la Sarthe next year, which Carroll Shelby guided its predecessor to back-to-back victories nearly a half century ago - when Ford and its iconic Ford GT 40's won Le Mans twice under Blue Oval's Iron Hand leader simply known as "The Deuce!" As Henry Ford II was so enraged over Enzo Ferrari's slight towards buying his 'lil car company that he ordered management to defeat Enzo at the revered French endurance classic whatever it costs! With GT 40 derivatives ultimately winning four consecutive years with some English Chaps running under John Wyer's tutelage in 1968-69!